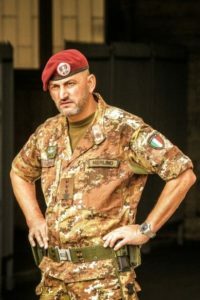 Colonel Franco MERLINO is an Officer of the Italian Army’s Parachute Unit. He began his service at the Military Academy in 1987 with the 169th Course “Orgoglio”. After having served as an instructor for the new cadets in the Military Academy, he undertook in the “FOLGORE” Brigade all the periods of command up to Regimental level. While in command of the 183rd Regiment “NEMBO” he served in Afghanistan as Commander of the Transition Support Unit in Shindand. He was also the Commander of the Parachute Training Centre in Pisa. He served in the General Staff in multiple circumstances where he worked on the long-term planning of the Army’s operational component, at the Army General Staff and on Policy Education at the Defense General Staff. In his assignments abroad he attended the high – level joint course at the military school of the French Armed Forces and served as Assistance Defence Attaché at the Italian Embassy in CAIRO from 2009 until 2012, coinciding with the Arab Spring. He was involved in operations in the Balkans and in Afghanistan. Since 2016 he is the Director of the Security Force Assistance Centre of Excellence and has followed its creation as an International Body and its subsequent accreditation as a NATO Centre of Excellence.